Great for travel, dining out, or visiting grandparents, this baby harness makes feeding on the go a snap. A portable baby seat for your little bundle, this ingenious harness invented by new mom Carren Rieger securely straps to adult chairs to instantly accommodate children five months old through their toddler years. Designed with a five-point safety harness and fully adjustable straps, this streamlined device makes feeding on-the-go safe and simple. Great for travel, restaurant dining, or just visiting grandparents and friends, Porta Chair is the perfect travel accessory for new parents. The Porta Chair is machine washable, lightweight and AZO dye, phthalate and formaldehyde-free. 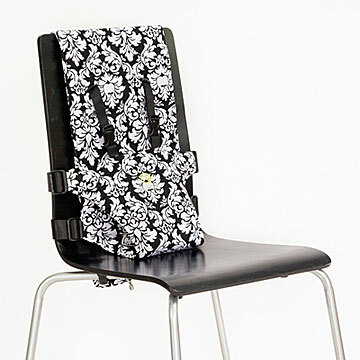 A former strategy consultant, Rieger designed the Porta Chair Harness after moving to Australia in 2006. Challenged by the demands of traveling with young children, Rieger dreamed up this portable solution to the traditional highchair, crediting her "on-the-go babies" for its creation. Supports up to 35 lbs. Made in China. Please click here for a PDF of the included instructions. Machine wash separately (warm or cold water), hang or lay flat to dry. Upper age and weight limit: 30 months or 35 lbs. The Porta Chair is designed to work as a temporary high chair and provide support for your baby while sitting on most adult chairs. Carefully read and follow all warnings and instructions before use. Your child must be secured using the adjustable shoulder straps and five point safety harness at all times. The height adjustable straps are designed to keep a baby from gaining forward or sideward momentum to create a stability risk. Never leave child unattended while using the Porta Chair. Never allow the child to attempt to stand up while in the Porta Chair and do not use if child is trying to rock back and forth as this could cause the chair to topple over. My friend said it's difficult to find high chairs abroad and even when restaurants have one, her baby wouldn't fit in it so this was a perfect solution! It was a gift, but they loved it! This was gift and the baby hasn't arrived yet. I'll come back in a few months to update how they liked it. Great Idea. Needs to be made in more colors! I'm going to rate this 5 stars because its just so practical. Please make it in cuter colors! I bought for a baby shower . No one else bought anything else like this for Gabriella, and she was thrilled with it because she is a working woman on the go. My niece was thrilled with this portable chair harness. She had never seen anything like it, and said it will be wonderful to be able to frequent their favorite cafes, which don't have high chairs or child seating. I also gifted this to a nephew and his wife for their baby girl, and they also were thrilled. Imagine being able to eat out, or even visit family and friends and not have to worry about what to do with baby come meal time? This is going to be my go to baby gift for sure! I can't say much about the product as it was not for me but i did check the quality before giving it to my friends and it seems like pretty good quality. I will find out from them next time. This is not a climbing harness :). I say this as the stock selections for best uses refer to actual rock climbing. This is great for my grandson (7 months) to use instead of a high chair. Attaches easily to chair, safe, easy to clean. There were not directions in the box (the picture on the box was not accurate). The web site video was perfect.